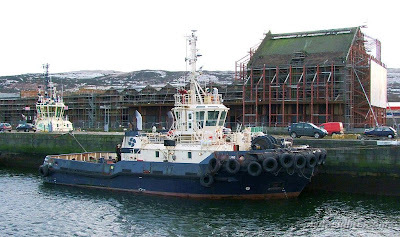 The Clyde tug fleet has a new member, following the departure of SVITZER MALLAIG to Milford Haven, where she will be used at a new LPG terminal which required modifications to her bow fendering, carried out at Fergusons Shipyard last year. Her replacement is one of the earlier vessels in the 'M' class, SVITZER MILFORD, which has the slightly lower bollard pull of 62 tonnes ahead, and 55 tonnes astern. 'Milford' differs from 'Mallaig' in that she is fitted with only one towing winch, and a conventional towing hook aft. Built at the Baltija Shipyard in Lithuania, SVITZER MILFORD is registered at Milford Haven, meaning that possibly for the first time there is no Svitzer tug with a local port of registry - AYTON CROSS is registered at Middlesbrough while WARRIOR III flies the Irish flag and is registered at Westport. if your the rob in greenock just to let you know svitzer mallage is now bk in greenock.